I had a great start to my weekend. Yesterday my friends Rasha and Tamara met me at Taqueria el Poblano, a really tiny, apparently very popular Mexican place on Mount Vernon Avenue in Del Ray. Seriously, I had to wait in line outside for 40 minutes before I got a table and it was like 30 degrees. The food was OK, but I guess what people like about this place is that it’s teeny tiny and has that local neighborhood feel that you don’t find much in the suburbs. After dinner, we went to my apartment and watched Love Actually. I offered everyone popcorn, but no one was interested in my nasty organic stuff. While we were watching, we were debating what year Love Actually is from; there were a few guesses for 2010, 2008 at earliest…then I looked it up and it turns out it’s from 2003! I was 18 when it came out! Somehow, the first decade of the 2000’s just kind of happened and slipped by me without me even noticing. Strange how time accelerates as you get older. Anyway, this morning I was feeling motivated as I rarely am, so I decided to check out a Zumba class in the downtown area of my neighborhood. I got up at 7:30, made myself a nice, balanced breakfast (peanut butter and jelly sandwich and slice of tofu — one of the perks of being a single lady who doesn’t like to cook), bundled up and started my steep descent to Mount Vernon Avenue, the main thoroughfare of the Del Ray neighborhood. I was really nervous. First of all, I was running late. Second of all, it’s been a long time since I’ve done any exercise other than walking. Third of all, I was experiencing serious anxiety that my fellow Zumba-ers would be talented, slender-limbed amazing dancers and I would look like a giant, uncoordinated klutz in comparison. On several occasions I almost convinced myself I should just go on a walk instead. But eventually I got to where I needed to be, this ballet studio housed in this old(ish) building where I found myself surrounded by several friendly looking, mostly roundish older ladies shivering in the cold because the instructor, Jenny, had misplaced her keys and was frantically searching through her many bags for them. Immediately, I felt at ease. Jenny is my kind of instructor. I feel instant good vibes with anyone else who suffers from lost key syndrome and carries lots of bags. Finally, Jenny’s husband called her to inform her that she had left the studio keys on the kitchen table and had to drive them down to the studio. After a few minutes the keys were delivered and up we went to this dingy looking studio with wall-to-wall, floor-to-floor mirrors (my worst nightmare) and a weird, slightly musky smell. But despite the less than luxurious conditions, I had a great time. I had forgotten how much I love Zumba…any kind of dancing, really. I need to do some Grouponing and find some dance classes near my new place. After class I was feeling good. Really good. Better than I have in a long time. I was happily walking home, thinking about how great my life is right now, how lucky I am to live where I live, have the job I have, the family I have, the opportunities I have…basically walking along in an endorphin-fueled state when suddenly, out of nowhere, I was attacked by a tree. My happy walk is usually pretty brisk so this was no fender bender. This was a full-on crash. I survived Zumba injury and embarrassment free, only to crash into a tree. 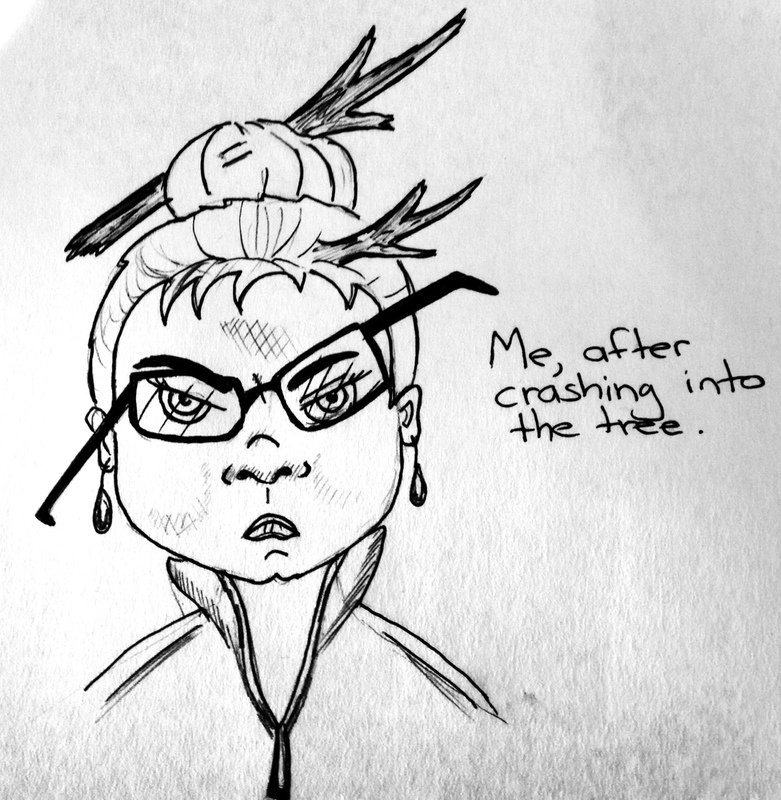 Luckily, the offending tree was only a baby tree, about my height and not very scary-looking but still, it’s pretty embarrassing to find yourself tangled in a tree with branches sticking out of your head in the middle of the day. Really, it’s very unattractive and less than lady-like and especially embarrassing when other people are around to see you and ask you if you are OK. I don’t know why stuff like this always happens to me. Or why it can’t happen at night, when not one’s around to see. The way I felt after crashing into the tree. After assuring all witnesses I had escaped unharmed, I completed my steep ascent to my apartment in a state of shame and embarrassment and then took a three hour nap. So basically, in my world, one hour of Zumba equals a three-hour nap, which means I can really only do serious exercise when I have no other plans for the day. In fact, I still feel sleepy. But this whole Zumba thing has made me think: This morning, I paid $10 for a drop-in class and my immediate reaction was an internal cringe over the high cost of dancing for an hour. But then, if I really think about it, I don’t hesitate to spend $10 on overpriced cocktails or a mediocre meal (not including tip and tax!) so maybe my priorities are wrong, because I’m pretty sure one hour of Zumba is much better for you in the long-term than one $10 cocktail! In fact, right now I’m sitting in one of those fru-fru-fra-la-la organic, 100% recycled material cafes. The chairs are neon green and there are slightly unsettling pictures of lobsters and vegetables on the walls and I just ordered a decaf coffee (good but not particularly memorable) and a curried sweet potato-leak bisque, this olive-colored baby-food-textured, weird-tasting concoction that is memorable only because I’ve decided that sweet potatoes and leaks aren’t a good combo unless you’re under 12 months old. And I’m pretty sure I paid close to $10 for the this. So really, paying $10 for something that’s actually good for me shouldn’t be so painful. Anyway, I’m hoping to do more dancing. It’s much more enjoyable to me than jogging or going to the gym, so I might as well do exercise I enjoy, even if it means giving up a cocktail or two a week. ‹ I like Nice Grocery Stores and I Cannot Lie. You should have looked calm, and said, “I meant to do that,” and kept walking. If only I had been so smooth.